The Cycling Safety Ordinance requires the city to add permanent separated bike lanes when doing reconstruction of certain roads. In five or 10 years, bicyclists in Cambridge may marvel at a comprehensive network of bike lanes on city streets and the foresight of their city government. Or they may pay little mind to history and just pedal by, taking for granted that protected lanes for bikes (and probably by then, scooters) were always there. However that future plays out, it will be thanks to an ordinance passed last week by the City Council mandating that bike lanes be built whenever roads identified in a preexisting Cambridge Bicycle Plan are reconstructed, unless there’s a compelling reason against it. 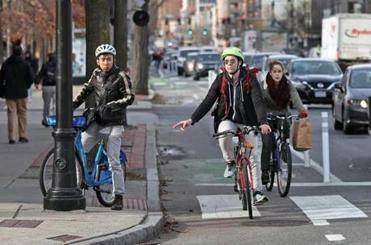 Cambridge officials and bicycling advocates say it’s likely the first such ordinance in the nation. The goal is a network of 20 miles of protected bike lanes. The idea is both to encourage cycling over car use and to reduce conflicts between all users of the roads. It also continues a penchant by the city of adopting streetscape innovations well ahead of neighboring cities and towns. “This ordinance gives the bike plan teeth,” said Sam Feigenbaum, a volunteer with Cambridge Bicycle Safety. Although since then, GPS may have helped solve the street sign problem for some road users, the 21st century has brought other issues, such as Uber and Lyft drivers stopping in traffic to pick up passengers. Last fall, Cambridge installed its first ride-hailing pick-up/drop-off zone, as did Somerville, with Boston following suit. To be certain, Cambridge isn’t alone in innovations. Boston piloted the region’s first autonomous-vehicle testing program, Everett the area’s first dedicated bus lane, and Brookline the first local scooter pilot program. “We can learn from each other,” says Chris Osgood, Boston’s chief of chief of streets, transportation, and sanitation. Nor has Cambridge reached traffic nirvana. Areas like Harvard Square are still jammed with no end in sight, and no traffic innovation is foolproof. With hundreds of other cities, Cambridge is part of Vision Zero, an initiative to completely eliminate traffic fatalities. That hasn’t been achieved. Continued cyclists fatalities are one impetus for the bike lane push. But the city isn’t falling back on the way things have always been done, either. To their credit, Cambridge transportation officials show a willingness to buck old traditions and embrace innovation, and to keep things moving, safely.